We’re back! We’re going bigger. We’re going better. WE’RE GOING TO HELP WALLARA BUILD AUSTRALIA’S MOST INCLUSIVE FARM. We can’t do it alone, so once again, we’re calling on supporters old and new to get behind our fourth Community Day at Sages Cottage Farm. Our target is high – $20k – but we know we can do it. We know that collectively we can raise the money, rally the volunteer troops and deliver on a range of projects on the farm that will make a difference and help build a truly inclusive experience for visitors to Sages Cottage Farm and in doing so, raise awareness, understanding and ultimately acceptance of people with different abilities. So committed is GPT, that we’ve thrown our hat in the ring again and started the ball rolling with a donation of $6,000. We have $14k to go. Please help us. No donation is too small. Every donation is very much appreciated. This year, we’ll be building two more Sensory Stations on the Sensory Pathway – which we made accessible last year. We’ll be building a bird hide on the beautiful island which is overlooked from the Stations, funding sensory items for the stations and raising funds for the purchase of a bush wheelchair to allow those in need of a wheelchair to experience the 370 m of track around the beautiful lake and enjoy a sensory experience like no other. But, wait! There’s more! In addition to some garden projects, there’s the annual mulch laying ……. all 30 cubic metres of it! Yes, team, we enjoy a challenge! 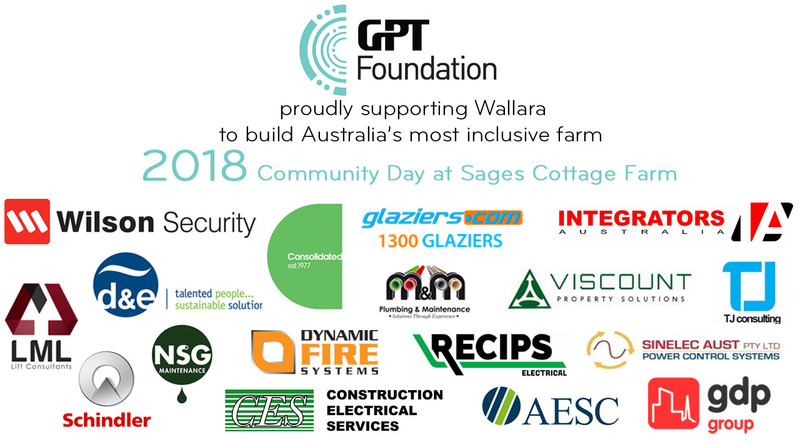 We hope you can be part of our 4th Annual Community Day at Sages Cottage Farm and help us, help Wallara, build Australia most inclusive farm. Upload attachment (Allowed file types: jpg, png, maximum file size: 24MB. Thank you Schindler! Your donation is very much appreciated. Very proud to be supporting GPT in such a worthy cause! From the team at Consolidated Property Services. WOW! Go Consolidated!!! Thank you so much. Look forward to catching up with Francys and Sanjeewa tomorrow. From the team at LML Lift Consultants, we are proud to support such a worthy cause. Well done to the team GPT and your supporting suppliers and contractors! Thank you, Dean and the team at LML Lift Consultants. We are blown away by the generosity of GPT and everyone who has chosen to support our work at Sages Cottage. THANK YOU! Fantastic! A huge shout out to the team at Glaziers. As always, your support is very much appreciated. Thank you so much GDP. As always your generosity is very much appreciated. Fantastic Community Event…. Go Rachelle! This is a great community project. Well done all at GPT! Wow! This is fantastic, Dean. A huge thank you to you and the team at Integrators Australia. Thank you so much Carey and Dean for getting behind the Community Day again. Really appreciate your generous donation. Thank you so much, Viscount Property Solutions. Great to have you on board once again. Thank you for your generous donation. Fantastic to have D&E Air Conditioning supporting us again this year. Look forward to seeing Stephen on 26/10. Happy to be a part of such a worthwhile initiative. Wishing you all the best for fundraising and the community day. Thank you for your support TJ Consulting Engineers. Great to have you on board! Your generous donation will go a long way in assisting us with the projects to be completed on the day.. We will keep you posted as things develop. Good Luck to GPT and all involved in this years annual community day at Sages – a truly wonderful and worthwhile program.. On behalf of Wilson Security. Thanks to Wilson Security and all the other supporters, we’re looking forward to another fantastic day. Let’s hope the sun shines on Sages on 26 October! Thanks so much Andrew, I am always blown away by the generosity of others, its such a great cause, and we will have plenty of pics to show you where you have contributed. On behalf of Wilson Security, Good Luck to all involved in such a wonderful and worthwhile community project. Thank you so much, Andrew. It’s fantastic to have Wilson Security back for the 4th year! Your generous support is much appreciated. Well done . What a terrific community achievement. Thank you for helping us build Australia’s most inclusive farm, CES. Your support is greatly appreciated. Thank you CES, what a champion effort from the team working at Melbourne Central. Again, you are welcome to join us on the day if anyone feels upto the challenge? A great cause I hope the day goes well. Thanks heaps Dean, every donation is a blessing. We appreciate you supporting such a great cause. Appreciate the continued support of the AESC Team. Thanks Nathan. Thanks so much Bruce, Guy and the team at AESC. Is anyone coming along as well? Thanks so much, Mick – you were first to respond to Rachelle’s email last year too!! Thank you so much for your continued support! Thanks for your support, Chain Social!